This cheesy, Mexican-inspired quinoa dip is packed with protein and veggies for a semi-healthy tailgating treat! One tailgating [or homegating] staple for me is dips. Cheesy, creamy, delectable dips that I can dunk tortilla chips in are my favorite thing ever! Notice that I didn’t say I’d dip veggies in dip. I’m not above healthifying a cheesy recipe, but I AM above dipping veggies in a cheesy dip. That’s just weird. For dips, tortilla chips > veggies, imo. 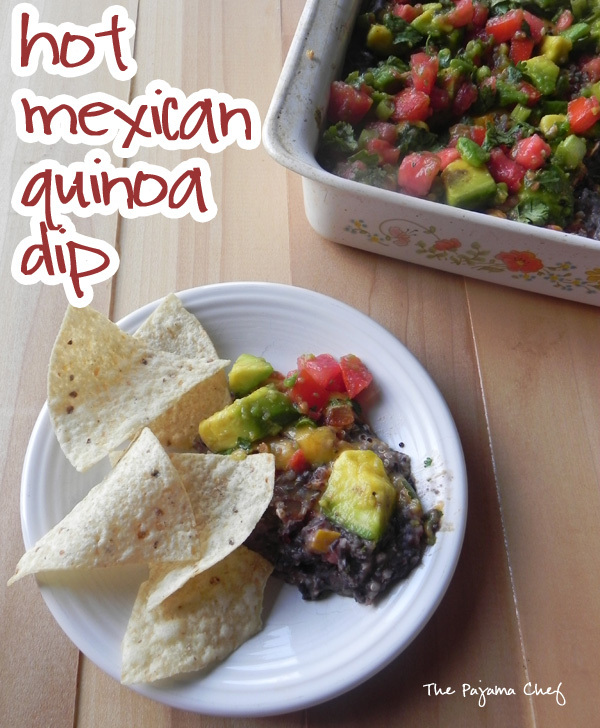 This Hot Mexican Quinoa Dip is full of all my favorite things! It’s a twist off of seven layer dip, and it’s even more delicious because it’s hot, gooey, and bubbly. I don’t think there are quite seven layers: black beans [pureed with garlic, cayenne, cilantro, and cottage cheese–weird-ish I know, but adds protein and makes ’em creamy], quinoa, cheese, bell peppers, salsa, avocado, tomatoes, green onion, and cilantro. I guess that’s nine layers! Extra yum, huh? Ben and I ate almost the entire pan of this one Saturday night while watching a movie–it is that good! It almost reminds me of a black bean quinoa casserole that I’ve made before, except you eat it with chips so it’s extra fun. 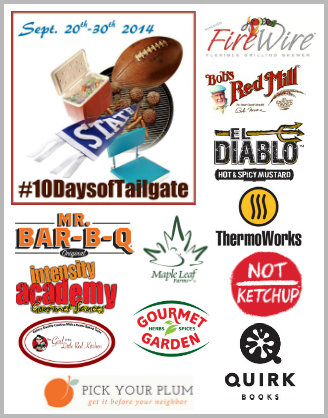 For some reason I feel a bit uninspired writing about it… but know this: it is amazing and addicting and perfect for anything from tailgating to a girls’ night in! Enjoy! 1 cup shredded cheese – cheddar, Mexican blend, etc. your choice! Grease a 9×9 inch pan with cooking spray. Preheat oven to 350 degrees. In a food processor, combine all ingredients for the beans and process until mostly all ingredients are incorporated. It doesn’t have to be completely smooth. Add extra water if necessary to thin it out. Spread half of the bean mixture on the bottom of the pan. Top with half of the quinoa, half the bell pepper, half the cheese, and half the salsa. Repeat with remaining ingredients. Cover with foil and bake for 30 minutes. 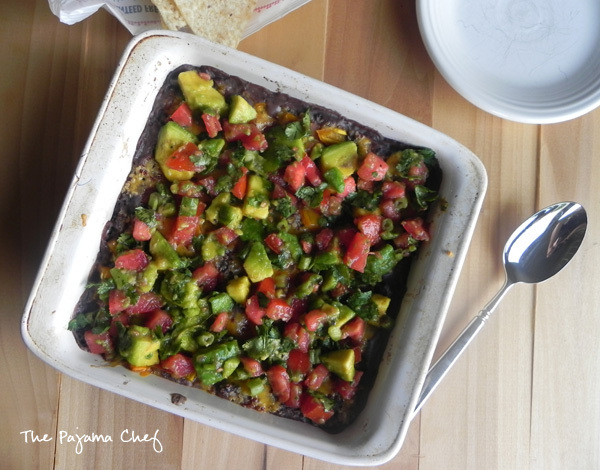 Let cool for a few minutes, then top with avocados, tomatoes, cilantro, and green onions. Serve with tortilla chips and hot sauce if desired. This month for the Secret Recipe Club I was given the wonderful Sarah’s blog, Things I Make (for Dinner). Note that the URL of her blog reads “oreos and cool whip.” How fun! Be sure to read her about page for an explanation of that! 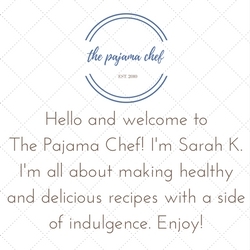 🙂 Sarah’s blog is full of tasty recipes, which isn’t a surprise since she has such a great name! 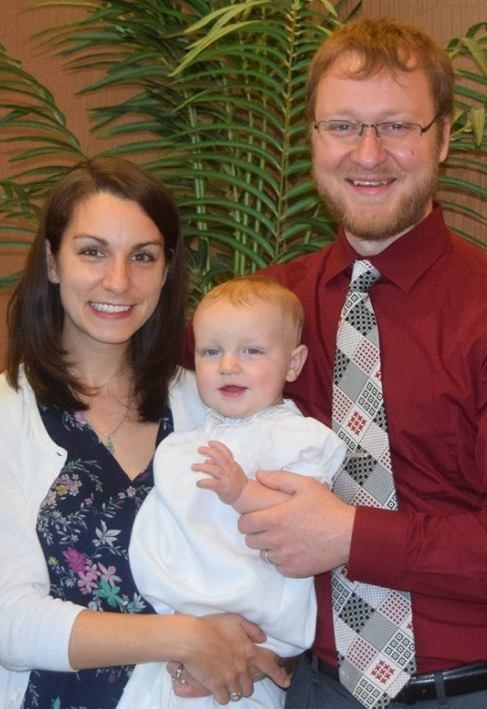 She lives in Ontario with her husband and loves challenging herself to try new recipes, especially from magazines. 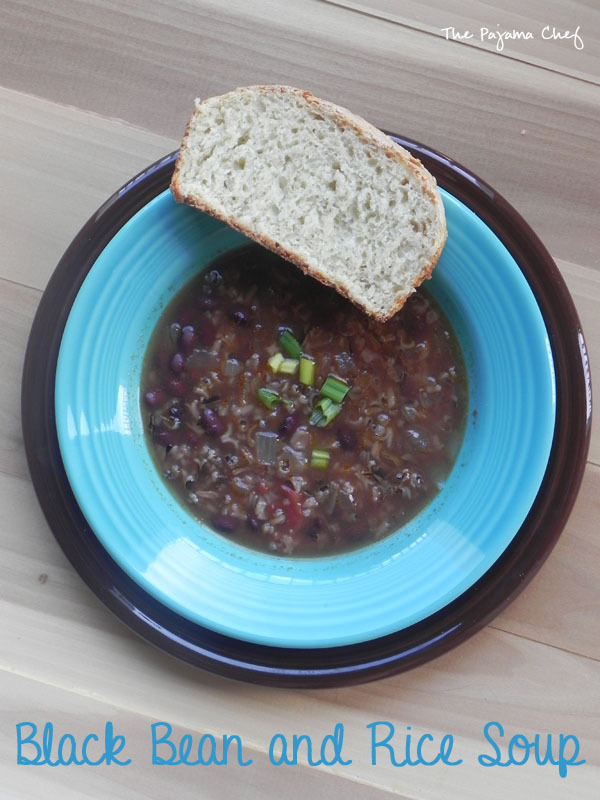 As always I found many many recipes to try, but had to choose one–this awesome Black Bean and Rice Soup! If I had had more time, I would have made this Strawberry Cream Cake Roll. If I had needed to make an appetizer, these Buffalo Chicken Wontons look incredible. And when peaches are in season, this Peach Cobbler will definitely be on my table! But back to this soup. 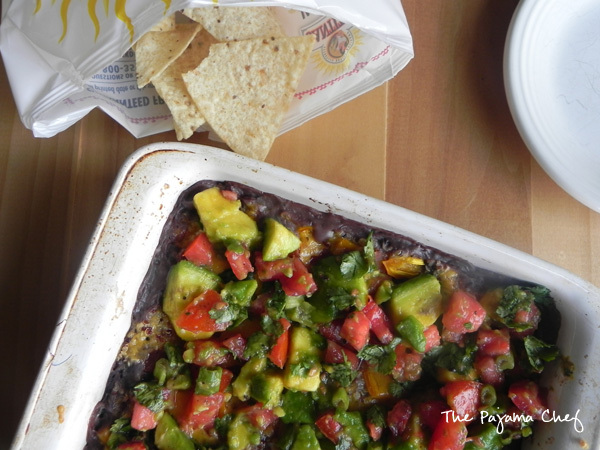 If you follow my blog, you’ll know that we often eat black beans and rice for dinner. It’s easy, fast, inexpensive, and we almost always have the ingredients on hand. Plus, if you add some salsa and taco seasoning, it’s basically Mexican food, right? And I love love LOVE Mexican. 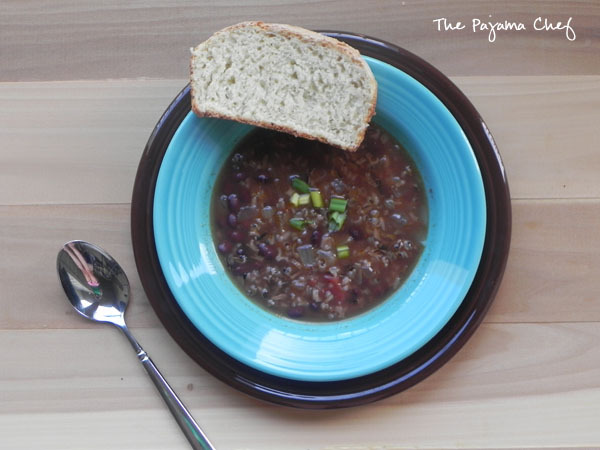 So naturally I had to make this soup, even though it’s been in the 80s here in Nashville. Naturally. This soup is just as good as it sounds. I changed up Sarah’s recipe a little to exclude chicken [because I didn’t have any cooked] and to include some extra rice [wild and white]. All in all, this is a hearty, flavorful soup that gets better with each bowl you enjoy for leftovers. In her post about it, Sarah mentions that her husband wanted to put cheese on it but she thought it was flavorful enough without. For the record, I totally agree with you, Sarah! You definitely don’t need cheese with this soup. We enjoyed it with some english muffin bread and were more than satisfied. Thanks for the great recipe, Sarah! In a large Dutch oven or stock pot, heat oil over medium heat. When hot, add onion and saute until soft. Add garlic and cook for about 30 seconds or until fragrant. Then add chicken broth, black beans, salsa, rice, cumin, and lime juice. Stir together, cover, and bring to a boil. Reduce heat to low and then simmer until heated through, at least 20 minutes or longer if possible. Serve with cilantro and green onions. 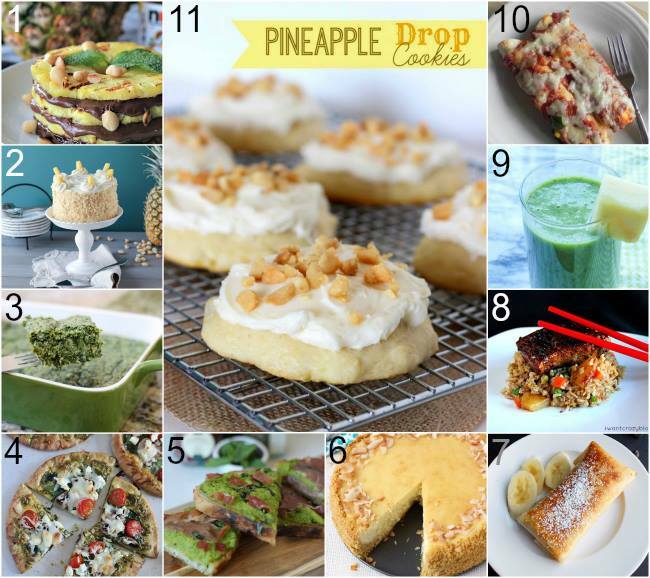 Check out other SRC recipes in group A by clicking below! These lentils have no business being this good. No business at all. I mean, lentils aren’t exactly exciting food, now are they? Well, I think these lentils are. I seriously can’t get enough of them. I can’t remember where I saw this recipe linked originally, but I am so glad I did because they have become a new family favorite. Healthy, versatile, good, simple, delicious. These lentils definitely support their “tasty” title. They are smooth and flavorful, a perfect vegetarian Mexican meal. 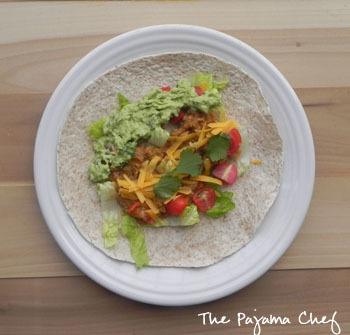 You can make burritos or tacos or burrito bowls or nachos with them, or eat them by the spoonful. [Oh wait–that might just be what I do!] They’re a little reminiscent of pinto beans [maybe refried beans] texture-wise, but flavor-wise they are absolutely incredible! In the recipe below, I suggest using red lentils. Brown or green lentils can certainly use used instead, but the cooking time may be different. Red lentils are just my fave–according to The Kitchn they are sweet and nutty. They also cook super fast, making these lentils a great weeknight dinner. I hope you give ’em a try soon! P.S. Don’t skip the avocado or guac as a topping–avocado + lentils=looove! Oh–before I forget! Ben loved this dinner too. He was a bit skeptical [tacos without meat?!?!] but was soon won over. I bet he’d even eat them on his birthday…which just so happens to be today! Yup, that’s right. He’s a St. Paddy’s Day baby. 🙂 Cake recipe coming soooooon. It was so good. 🙂 Happy Birthday to my love! Heat oil in a skillet set over medium heat. Add onions and cook until translucent, about 5 minutes. Add garlic and cook until fragrant, about 30 seconds. Stir in lentils and taco seasoning and cook for one minute. Pour chicken broth into lentil mixture, then bring to a boil. Cover and reduce heat to low, simmering until lentils are tender [about 12-15 minutes]. Stir in salsa and heat uncovered, mashing slightly, until thickened [about 3-5 minutes]. 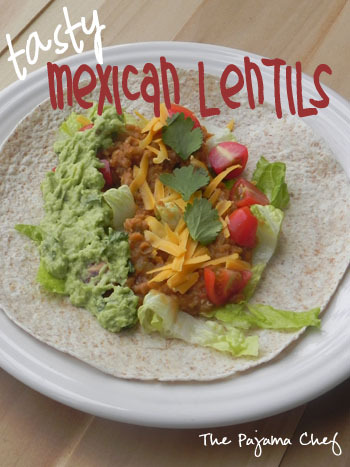 Serve lentils in tortillas or over rice with desired toppings. This month for Mystery Dish, Christine from I Dig Pinterest and I Did it Too was the head honcho. She gave us the following ingredients to work with: fresh mushrooms, pork, spinach, cream cheese, pineapple, butterscotch chips, macadamia nuts, Sriracha, Ritz crackers, and tortillas. When I first saw the list, I had dreams of a fabulous dessert. But things just didn’t work out due to family and work things… so dinner it was! But shhhh! 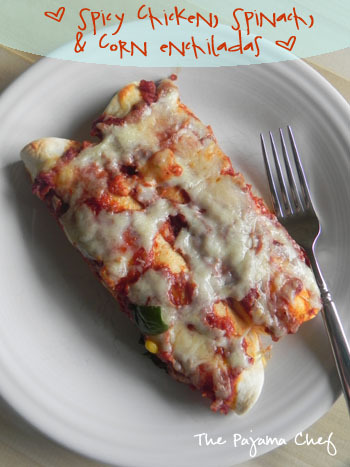 Don’t tell these enchiladas they were a second choice because they’d be oh so sad. They were SO tasty and SO spicy and SO worth it. 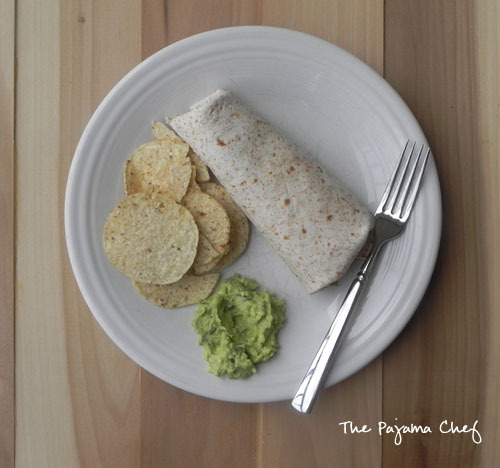 The two ingredients I used from Christine’s list were spinach and tortillas. I thought about also using Sriracha in the spicy enchilada sauce, but after a quick test taste, I realized there was no way I’d be able to handle the heat if I added that. 🙂 So two ingredients it was! Obviously tortillas are an essential part of enchiladas–but spinach? Sounds a little weird. But I’m never one to shy away from adding veggies where they are unexpected. The combination of chicken, spinach, and corn made for a delightful enchilada filling, and when we had a little leftover, I saved it for quesadillas later in the week. Also an excellent choice for this filling! If a super spicy sauce isn’t your thing, feel free to buy some or try my [old old old] recipe for a classic enchilada sauce. In a food processor, combine tomato paste, tomato juice, onion, green pepper, garlic, chipotle peppers, chili powder, cumin, and oregano. Process until smooth. 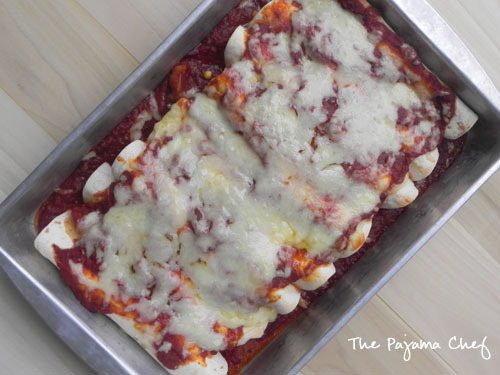 Spread 1/3 of the enchilada sauce in the bottom of a 9×13 baking dish. In a bowl, stir together chicken, spinach, corn, and salsa. Divide mixture between the tortillas, then place seam side down in the baking dish. Top with remaining enchilada sauce and the cheese. Time: 45 minutes [15 minutes active].